…I’m sorry, I’ll type that again. In a house with a Christmas tree and a stairlift, Clara is in bed. She’s awoken by voices up on the roof, and discovers Santa Claus bickering with two elves: Ian and Wolf. Wolf has his name on the back of his jerkin. Ian does not. And nor does Santa. There’s a tense exchange, and a second magical figure arrives..
Last Christmas continues the long line of Doctor Who holiday specials. Reuniting Peter Capaldi and Jenna Coleman, the story contains several familiar Steven Moffat tropes that weave together into a tense story featuring a new and sufficiently creepy alien threat and a memorable performance from none other than Saint Nick himself! It’s Christmas Eve at the North Pole, which means presents, elves, flying reindeer, and Santa Claus. What it shouldn’t mean is an alien threat with the potential to kill all of humanity without them even knowing that they’re dying. The Doctor and Clara find themselves, along with the scientific crew of an Arctic research station, at the mercy of creatures that only react when thought about or looked at. But is there more to the story? Is what they’re seeing really reality? The answer lies in one simple fact. 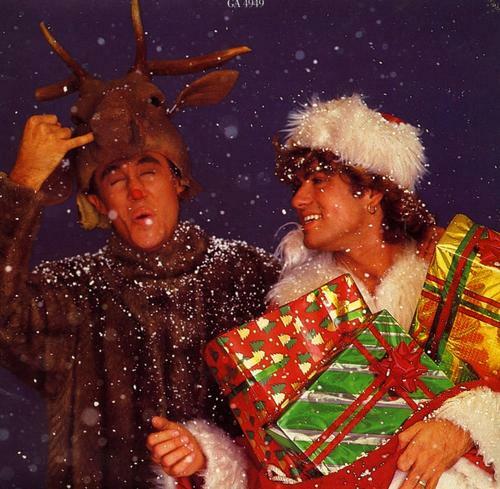 It’s Christmas Eve at the North Pole, which means presents, elves, flying reindeer, and Santa Claus! The Doctor Who Christmas specials have become a British tradition since the show’s revival and 2005’s The Christmas Invasion that saw the proper introduction of David Tennant’s Doctor…although, if one wants to get technical, 1965’s The Feast of Steven was the very first Christmas episode for the show. In the past ten years, there have been some hits (The Runaway Bride, A Christmas Carol), some misses (Voyage of the Damned, The End of Time), and a personal favorite (The Next Doctor). 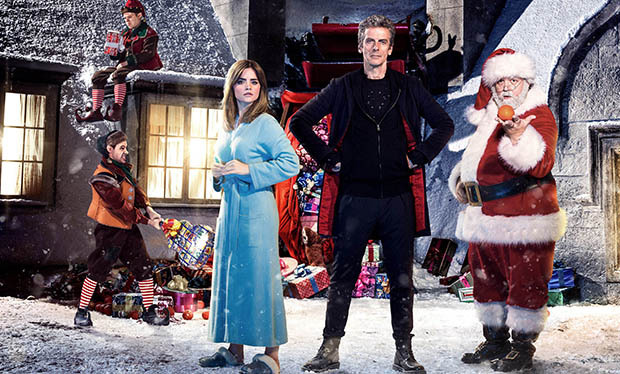 Last Christmas fully embraces the holiday season, not just indirectly in terms of set design and decoration but in opening the episode with Clara and the Doctor encountering Santa Claus himself up on Clara’s rooftop. When the Doctor turns to Santa Claus and addresses him directly, it sets helps set one of the major tones for the episode; a sense of whimsy. The episode delivers a lot of humor from multiple sources. To balance out the humor, writer Steven Moffat and director Paul Wilmshurst (Mummy on the Orient Express, Kill the Moon) inject the Christmas special with an appropriate level of horror. The script borrows very heavily from several other sources. The isolation of the Arctic base reminds viewers of The Thing From Another World, while the design and attack method of the dream crabs draw from the facehuggers from Alien and the headcrabs from Half-Life. Even one unnerving death scene seems to have come directly out of Videodrome. The story doesn’t rest solely on these sources, however. Instead, the influences are woven into the plot of Last Christmas, paired up with many of Moffat’s standard episode tropes. We have a quirky and standout female character in Shona, we have a phrase that becomes creepy by its repetition with “it’s a long story,” and we have creatures that can’t be dealt with directly in the dream crabs, all mixed in with the classic “base under siege” plot that’s been a staple of Doctor Who. What could have been just a jumbled mish-mash of horror movie cliches instead comes together in a story with plenty of creepy images such as the dream crabs descending from the ceiling or the “mouths” of the victims opening up during their attack. Moffat also injects a nice sense of drama into the holiday special. Aside from the ending sleigh ride once everyone is safe and waking up back to reality, Samuel Anderson makes a return as Danny Pink inside Clara’s “dream.” His presence isn’t a surprise, but Moffat doesn’t overplay his sudden appearance. The scene where Clara realizes she needs to wake up is quiet, understated and sad, with Clara’s subconscious admitting that Danny isn’t real and she will miss him even as she moves on with her life, all done via Danny himself. It’s a great coda to Danny Pink’s time on the show (I’m sure we’ll see Orson in the future in some way) and to me does a lot more to show just how close Clara and Danny were than most of their previous scenes together. As usual, Peter Capaldi and Jenna Coleman were absolutely fantastic in this episode. Clara’s confusion and eventual joy as seeing the Doctor and hearing the TARDIS again was mixed with the Doctor simply treating Clara like she never left, keeping her in his memory. The pair played off each other as they always do, in both manic times, tense times, and even the quiet times as the Doctor tries to convince Clara she’s dreaming of Danny. By this point, Twelve has become my favorite post-revival Doctor because Capaldi does such a wonderful job of showing both the alien side of the Doctor and his kinder, almost grandfather side. He’s a jerk, but he has the best interests of everyone at heart even if his idea of best interests don’t quite jibe with the best interests of someone else. And Coleman just works so wonderfully with Capaldi. The moment where she says to him “Doctor, give me something to do” is a statement on their entire relationship. She might not always understand what he’s thinking (heck, sometimes HE doesn’t understand what he’s thinking), but Clara knows that it will work out for the best thanks to his efforts. There was a lot of speculation about Last Christmas being Jenna Coleman’s last appearance show, but the ending (even if it went on a little too long – maybe Moffat borrowed from The Return of the King as well?) saw Clara and the Doctor, after admitting each lied to the other so they could both attempt to move on with their separate lives, departing in the TARDIS for a future adventure (The Magician’s Apprentice, which is a great name for an episode). On one hand, I’m a little way about Clara staying on because I believe companions such eventually leave. On the other hand, Coleman and Capaldi have had such great chemistry together during this season that I’m excited to see what Season 9 brings us. The Twelve/Clara pairing has been so instrumental to developing the Doctor’s personality. I’ve mentioned before that I feel the Twelfth Doctor is free of the baggage of the Time War, having regenerated from the more humanistic Eleven into a more socially harsh Doctor. Without the baggage of being “The Impossible Girl” and attempting to manage her grief over Danny, the Doctor and Clara can now travel without worrying about past baggage and instead focusing on gathering a whole new set of emotional luggage. For the first time, someone gets third billing behind Capaldi and Coleman in the opening credits, and it’s well deserved. Alongside his bickering elves (Nathan McMullen and Dan “Strax and various other Sontarans” Starkey”), Nick Frost absolutely steals the episode as Santa Claus. Best known for the Blood and Ice Cream trilogy of movies (Shaun of the Dead, Hot Fuzz, The World’s End), Frost IS Santa Claus in this story. Frost doesn’t walk the line between “is Santa real or isn’t he” so much as hop back and forth over it with a big jolly smile on his face. In the middle of an episode tinged with horror, his presence didn’t break the tension so much as it added to the mystery of it, with the teasing of Shona as she tried to apply science to him and his wagging of “it’s bigger on the inside” to the Doctor about his sleigh. Even his big speech to the dreamers didn’t come off as a lecture or smug, but as Santa delivering just the presents they needed to save themselves. I really can’t praise Frost enough, as he took the last moment from Death in Heaven and turned it into a wonderful performance that will stand the rest of time. More than anything, Last Christmas is the true finale for Season 8 as it brings the Doctor and Clara back together (thanks to Santa Claus) in an episode that just might be the best Christmas episode of the revival (the best Christmas episode ever being The Chimes of Midnight, of course). 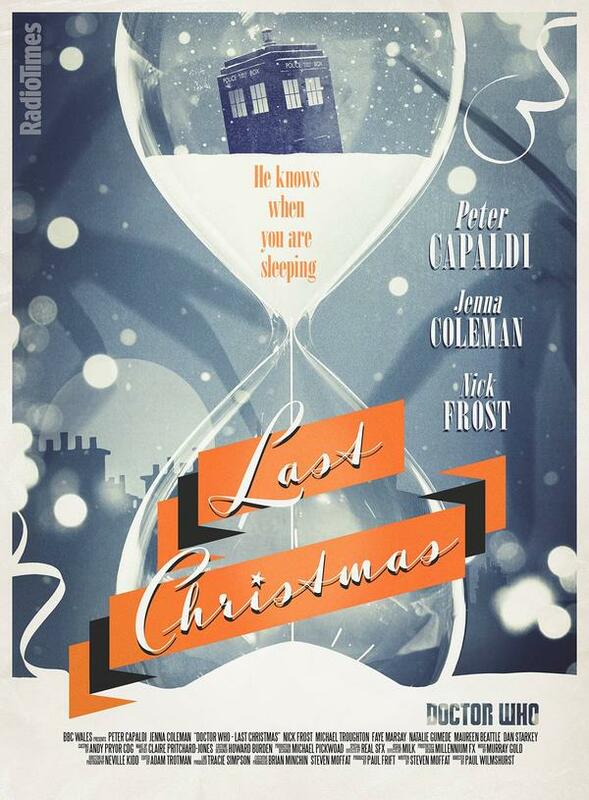 Mixing terror and humor with a touch of drama and wrapping it all up with some absolutely fine performances, Last Christmas ends a successful first year for Peter Capaldi’s Twelfth Doctor and a successful realigning for Clara Oswald. For the Time Lord and companion, the new year looks bright indeed! This entry was posted in Random Thoughts and tagged Christmas Special, Clara Oswald, Doctor Who, Doctor Who Review, Jenna Coleman, Nick Frost, Peter Capaldi, TARDIS, Twelfth Doctor. Bookmark the permalink.